Bulimia is a condition in which people “binge” and “purge.” That is, they eat too much and then feel compelled to get rid of the food by throwing it up. By all accounts it’s a very serious condition. Most of what I’ve read says it’s very difficult to treat, may take several years of therapy and is the result of serious childhood issues. I’ll call her “K,” she was an attractive, intelligent woman and the kind of person you instinctively like. She was competent in her career, had a good relationship and in general her life was together. There was really only one area that was a serious problem for her – her bulimia. “K” was hiding her condition from her family and was especially concerned with how the deception might be affecting her relationships, especially with her husband. She too had read about bulimia and was prepared to go through whatever ordeal she needed to go through to get to the bottom of things. “We may or may not have to delve into your past and we may or may not find anything unpleasant there if we do” I warned. You see, assuming there is some major trauma at the base of a problem can cause serious problems for the person with whom you’re working. Especially in hypnosis, you can create “memories” accidentally. These memories may not have actually happened -it’s called false memory syndrome. One of the ways to avoid this danger is to keep your own attitude in check. Don’t assume! I wanted “K to be prepared if there was trauma in her past and I wanted to acknowledge what she’d heard but I did not wish to create the environment where traumatic memories would be created. I started asking “K” a systematic series of highly targeted questions designed to uncover the exactly the resources she needed to solve her own problem. Ask the right questions and things can go very quickly. Ask the wrong questions and you can be running around in therapeutic circles for years. “So ‘K,’” I said. “I’d like you to go, in your mind to a specific instance where you’ve overeaten. Back up a little bit to the point where physiologically you’ve had enough to eat, the point where, if you stopped, your body would be satisfied. What’s going on?” What I was looking for was what I call the “decision point.” This is the exact moment her behavior turned from something that was working for her to an unwanted action. It turns out that during specific meals “K” felt that if she didn’t have some of every kind of food on the table she was missing out. That’s what drove the overeating? But what drove the purging? After eating too much, she felt terrible. So I took her to a time when she was purging and asked her how she felt. “Strangely enough, I feel a sense of satisfaction – a completion.” It seemed to me that completion and satisfaction were exactly the feeling she needed when she was about to overeat! So I amplified those feelings of satisfaction and completion and used a technique called anchoring so I could get them back later. Fascinating isn’t it? Neither you, nor I nor “K” do things without a reason. There’s always a payoff on some level. Even “K’s” vomiting had rewards – the positive feelings of completion and satisfaction. “Try this out in your mind,” I said. “Go to a time when you’re sitting at the table and you’ve eaten enough that you’ve met your body’s needs. What would it be like to feel that satisfaction and completion now.” At this point I fired the anchor, bringing back those positive feelings. You could see utter confusion on her face at first. As her brain rewired this situation and she began to feel satisfaction and completion her face smoothed out and the beginnings of a smile caused the corners of her lips to turn up. “I could stop eating and feel perfectly satisfied,” she said. Am I a miracle worker? Not quite! It’s just a matter of taking a systematic approach to getting the right information from your hypnotic subject. Once you have that information, the rest is easy. 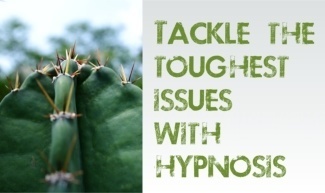 But what does that have to do with you and what you want to accomplish with hypnosis? Here’s the process behind what I did. You can do it too – for almost any problem, no matter how big or small. 1) Figure out what feeling is the payoff is for the current behavior. What do they get out of doing what it is they want to stop? For a smoker, it might be a feeling of satisfaction from smoking. Someone who overeats might get a feeling of comfort from the food (these are just examples, it will be different for each person). 2) Take those positive feelings, amplify them and make sure you can trigger them later. 3) Take them back mentally to the decision point (the instant they decide to do the smoking, overeating or whatever). At the decision point trigger the anchor to give them the positive feelings. 4) In a trance, lead them through several such instances and suggest that any time in the future, they’ll automatically have those positive feelings without the old behavior.